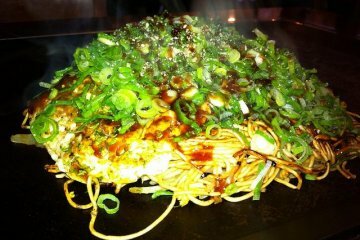 You haven't done Hiroshima if you haven't done Hiroshima-style okonomiyaki! Okonomiyaki, a savory pancake cooked on an iron hotplate, containing egg, chopped vegetables, meat and/or seafood, is found all over Japan. In Hiroshima, this dish is bulked up by adding noodles and lots of veggies. Rather than mixing all the ingredients together, as in the more common Kansai or Osaka style, here in Hiroshima they are layered. The whole thing is topped with a savory-sweet sauce. Usually served at small counter-style restaurants, it is generally eaten directly from the hotplate with a metal spatula called a hera. 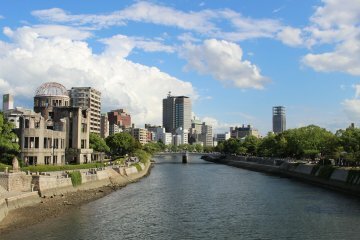 The locals are very proud of their contribution to Japanese cuisine, and regional rivalry, while good natured, is strong. 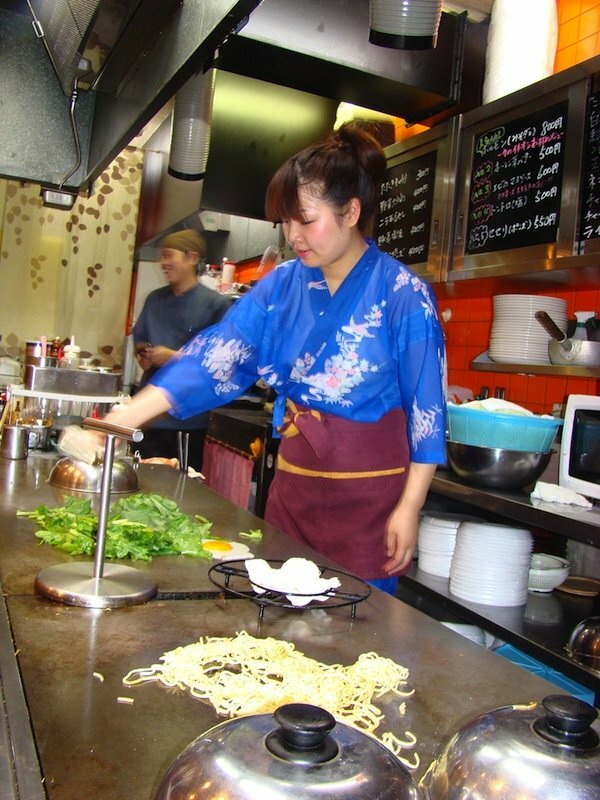 Be prepared to be quizzed about whether you prefer your okonomiyaki Hiroshima or Kansai style. 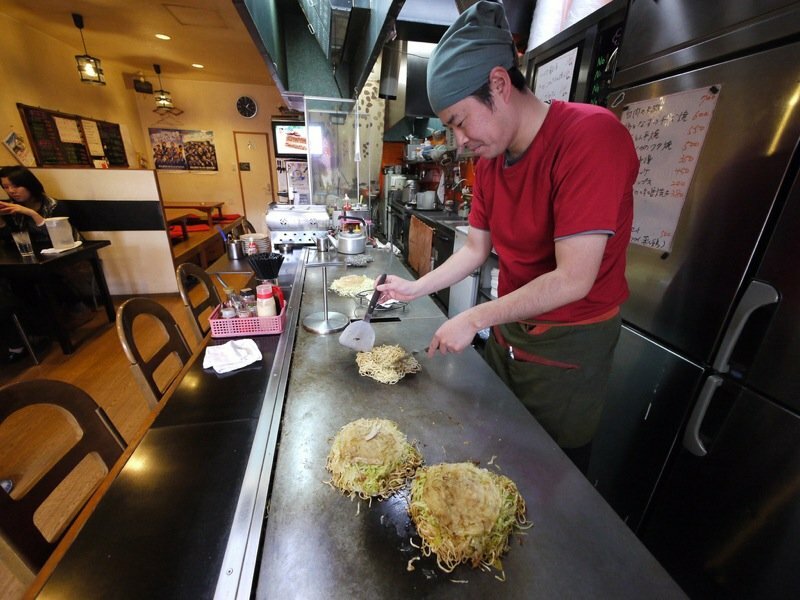 Sitting shoulder to shoulder at the counter of a local okonomiyaki joint, especially if you give the local lingo a try, is one of the best places for the outsider to connect with Hiroshima folk. 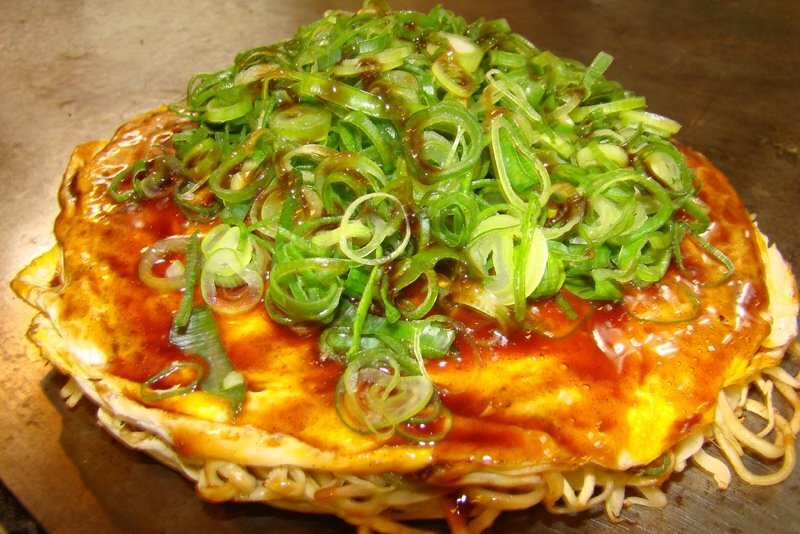 Okonomiyaki is often described as "Japanese pizza". 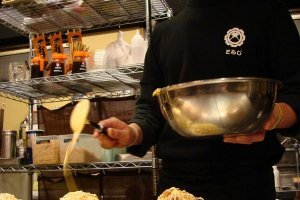 The name literally means "cook it how you like it", and you select toppings to add to the standard ingredients to create your personal favorite version of the dish. That's where the analogy ends however, as the finished dish, while round and flat(ish), tastes nothing like pizza. 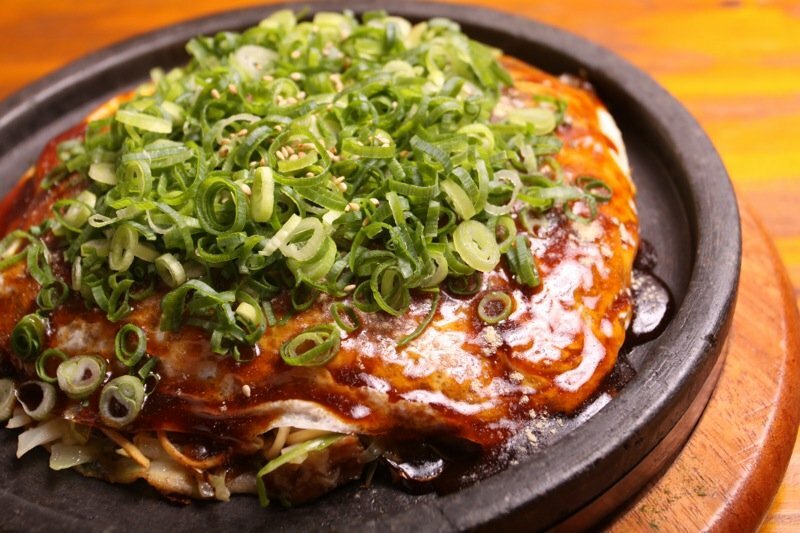 Sometimes described as Hiroshima's "soul food" okonomiyaki seems have evolved from a pre-war children's snack called issen-youshoku, which consisted of a folded crepe topped with onions and Worchester sauce. The dish became more widely eaten in the years during and after the war when rice was in short supply, and later people started to add more ingredients such as eggs, pork, cabbage and even noodles to the simple wheat pancake. Street stalls sprang up all over the city and today there are said to be about 2000 okonomiyaki shops. 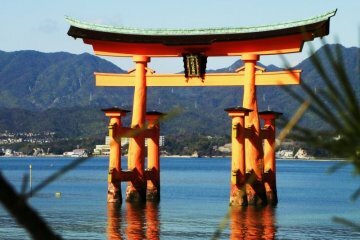 A visit to at least one of them is likely to be at the top of any Japanese tourist's list. 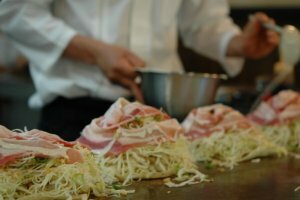 While it is fun to mix up your ingredients and cook them on your own hotplate, which is possible at many restaurants serving Kansai style okonomiyaki, Hiroshima-yaki is the preserve of the professional, and watching the process right before your eyes is really fun. With so many places to choose from, where is one to start? Micchan is probably the most famous, and there are several "Micchan" shops in the city center run by various branches of the family. They often have lines of customers outside waiting for their turn at the grill, which is generally a good sign. 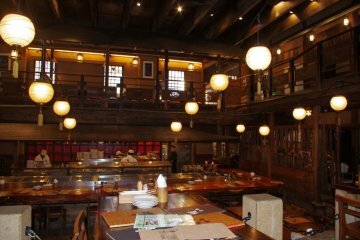 Very popular with domestic and oversees tourists is Okonomi-mura (Okonomi Village) which houses 27 little stalls on 3 floors. Okonomiyaki-kyowakyoku Hiroshima-mura (Okonomiyaki Republic) has another 6, and Ekimae Hiroshima Okonomi-hiroba (on the south side of Hiroshima Station) has 13 more. 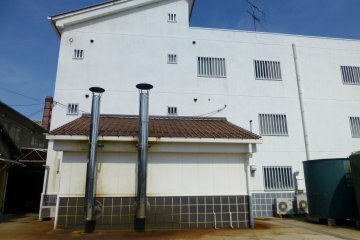 This is, however, just the tip of the okonomi iceberg. A fun way to make your choice is to leave it up to serendipity and ask a local. 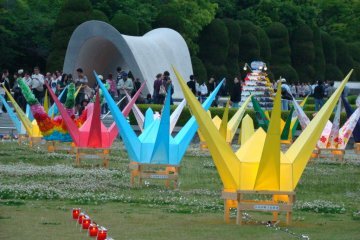 Every Hiroshima-ite has their own favorites and most will view it as a matter of pride to share them with visitors. 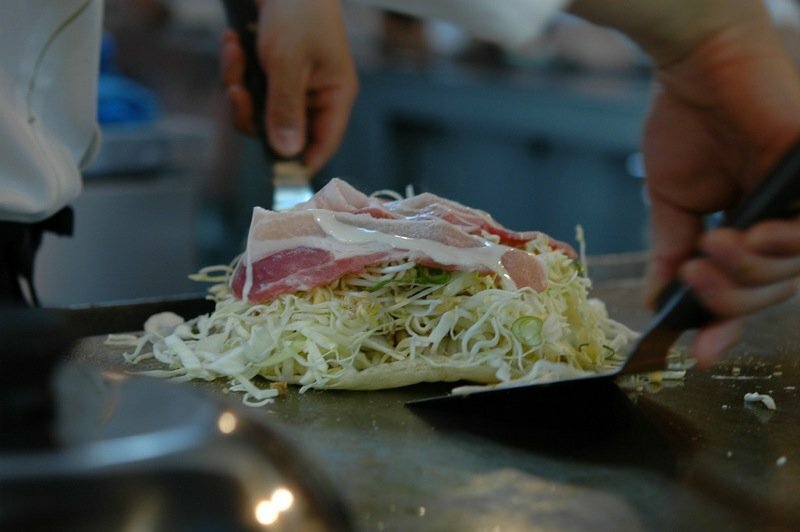 All Hiroshima okonomiyaki starts with the basic niku-tama, consisting of pork, eggs, cabbage layered between two thin crepes. 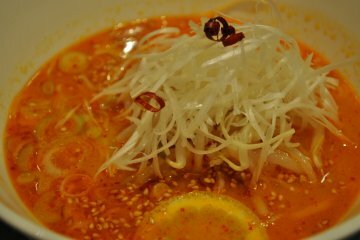 You first choose which kind of noodles to add - thin Chinese-style yellow soba noodles or thicker white udon noodles. State your preference by asking for "niku-tama-soba" or "niku-tama-udon". Next, choose any additional "toppings". These usually include extra negi (green onions), seafood, mochi (rice cake), cheese, Korean kimchee, shiso (perilla leaf), natto and, sometimes, even jalapeno peppers. In winter, it is also common to see local oysters offered as a topping. 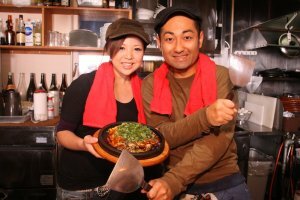 While the eggs rules it out for vegans, at first glance okonomiyaki appears to be promising option for hungry vegetarians. Chefs are generally happy to leave out the pork slices if you ask for "niku-nashi" (without meat), but most places do use lard and a kind of grease that includes pork stock. Shaved dried fish flakes or dried squid pieces are also likely to find their way into your meal. Strict vegetarians should head to Nagataya located at the very end of the Hondori shopping arcade near to A-bomb Dome; here they have a good appreciation of vegetarianism and are happy to accommodate vegetarian customers. Okonomiyaki is traditionally eaten hot (very hot) off the grill with a metal spatula (hera). 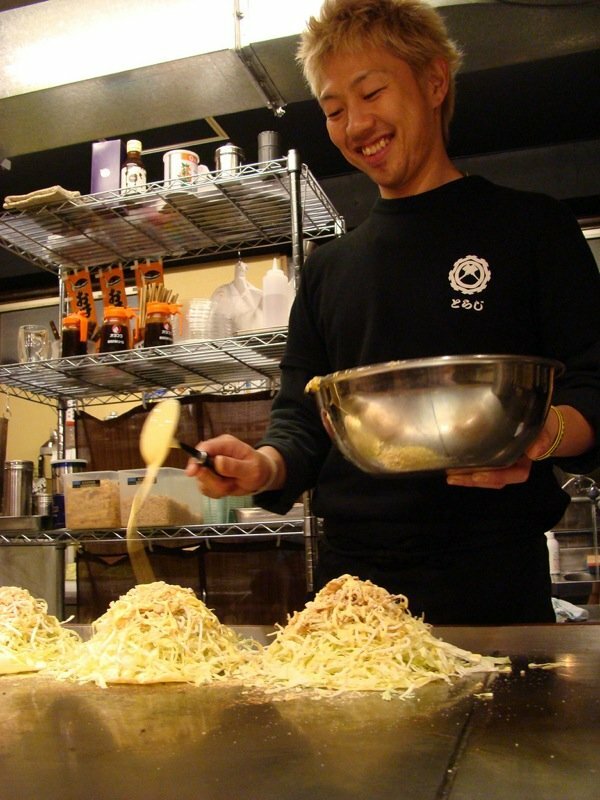 The inexperienced diner who takes up the challenge may find their okonomiyaki is dried to a crisp by the time they are finished. It is by no means rude to ask for a small plate and chopsticks; try for a laugh by saying "nekojita nanode o-sara to o-hashi kudasai" (I have a cat's tongue, so please give me a plate and chopsticks). It isn't necessarily a problem to linger at the counter and have some drinks, but be aware of your surroundings. If it is busy and people are waiting to eat, you will be expected to vacate your seats as soon as you are done eating. Love this! 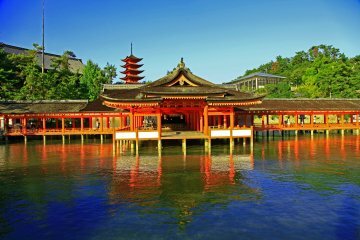 Very evocative - I remember being totally blown away by Okonomi-mura when I went there! 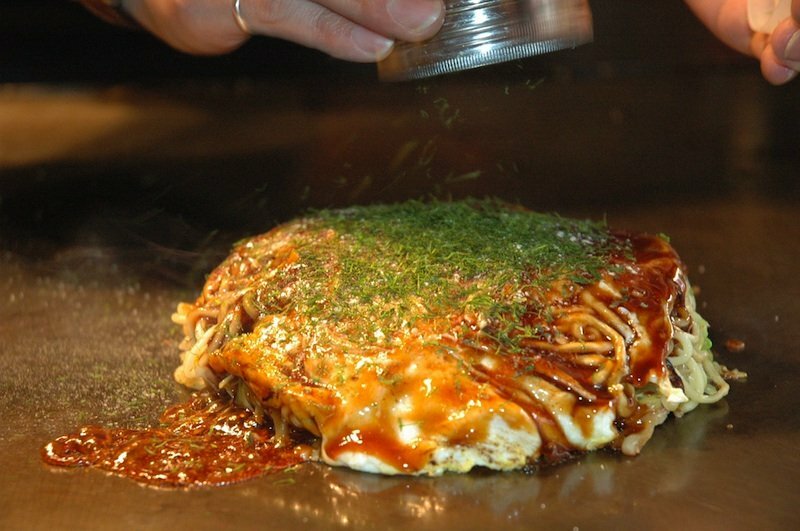 I have found a place to get okonomiyaki in London, but it's Kansai-style and also not a patch on the 'real thing'! 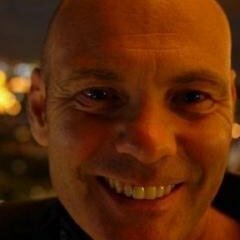 Did you take the pics, Paul? Nice! I was introduced to the Kansai-style first, but have to say I have been well and truly converted! Like a baby duckling imprinting the first creature it sees as 'Mother', Hiroshima-style okonomiyaki holds a position in my brain as the "real" okonomiyaki. My Kansai friends are not pleased. I love these regional food rivalries in Japan.